A longtime Boulder City Police officer made his father and his son proud this week as he was promoted to sergeant. 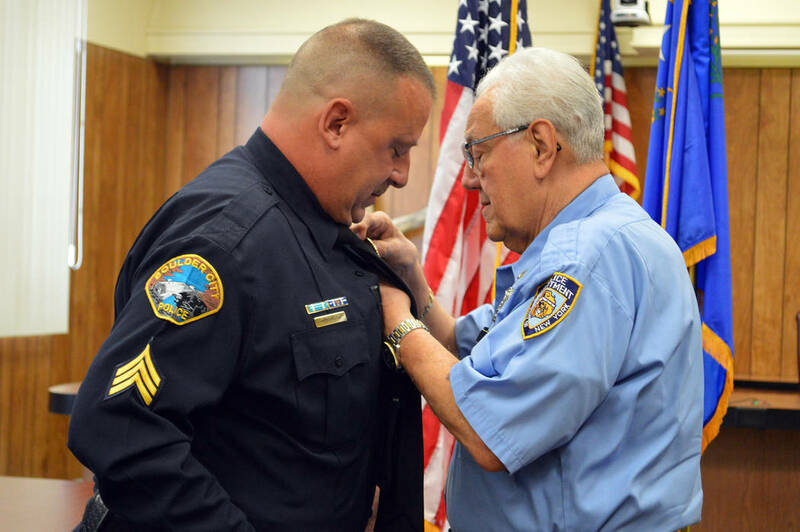 Celia Shortt Goodyear/Boulder City Review Retired New York City Police officer George Tomao pins a badge on his son, Craig Tomao, after he was sworn in at City Hall on Monday, Oct. 1, as one of two new Boulder City Police sergeants. Celia Shortt Goodyear/Boulder City Review Boulder City Police Chief Tim Shea swears in officer Tiffany Driscoll as one of two new sergeants on Monday, Oct. 1, at City Hall. Celia Shortt Goodyear/Boulder City Review Craig Tomao, right, was sworn in as a Boulder City Police sergeant on Monday, Oct. 1, at City Hall. 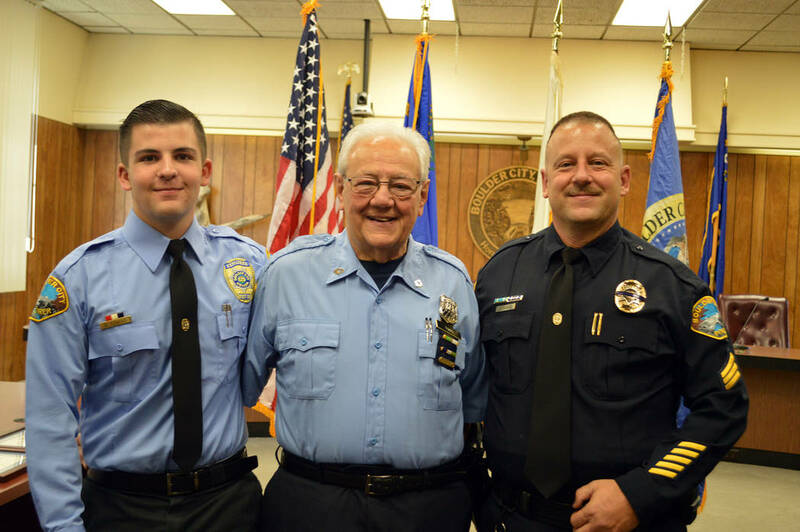 Attending the ceremony were his son, Domenic, left, a member of the department's Explorer post, and his father, George, a retired New York City Police officer. “If you wanted to be a police officer, I’d break both your legs,” is what retired New York City Police officer George Tomao said he told his son, Craig, when he was growing up. Craig Tomao, however, decided to go for the job. From 1990-97, Craig Tomao attempted to become a police officer. In 1997, he made it to the North Las Vegas Police Department, but failed in the last phase of field training. He joined the Boulder City Police Department in 1998 as a reserve officer and became a full-time officer in 1999. On Monday, Oct. 1, he was promoted to sergeant and his father pinned his new badge on him during the ceremony before family, friends and community members at City Hall. Helping and interacting with the community is one of Craig Tomao’s favorite parts of working in Boulder City. “I absolutely love this community. … I’m humbled to be standing in front of you, getting my stripes,” he said Monday. Craig Tomao has worked in a variety of roles for the department, including as an officer and a detective, and said he applied for the sergeant position because he felt like it was time to move in a different direction. “I thought it was time for me to lead a squad,” he said. Throughout his career, Craig Tomao would go to his dad for advice and help when he needed it. George Tomao said he helped when he could. “Something as simple as that makes it (a call) easier to handle,” George Tomao said. “That’s absolutely true to this day,” agreed Craig Tomao, who added he uses that technique every day. Craig Tomao’s 18-year-old son, Domenic Tomao, is involved the department as a member of Explorer Post 198. Like his father and grandfather, Domenic Tomao said he enjoys working with the community and wants to be a police officer. “I think it would be good going from grandpa to father to son,” he said. 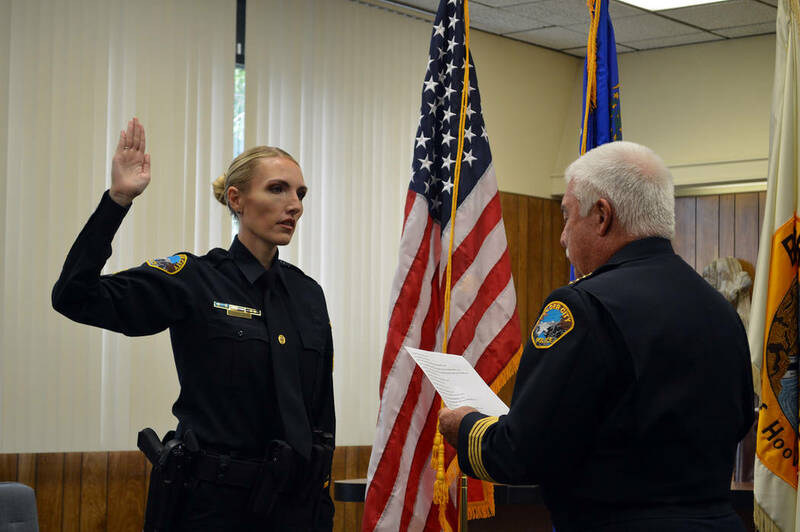 Also getting sergeant stripes and being sworn in Monday was officer Tiffany Driscoll, who was Craig Tomao’s trainee. Boulder City Police Chief Tim Shea said police sergeants are the ball bearings of the department. “In the world of police work, the rank of sergeant is one of the hardest to fill. … It’s a stepping stone for the future and I know they’re capable of big things,” he said. Additionally, Joseph Negri was sworn in as a reserve police officer.